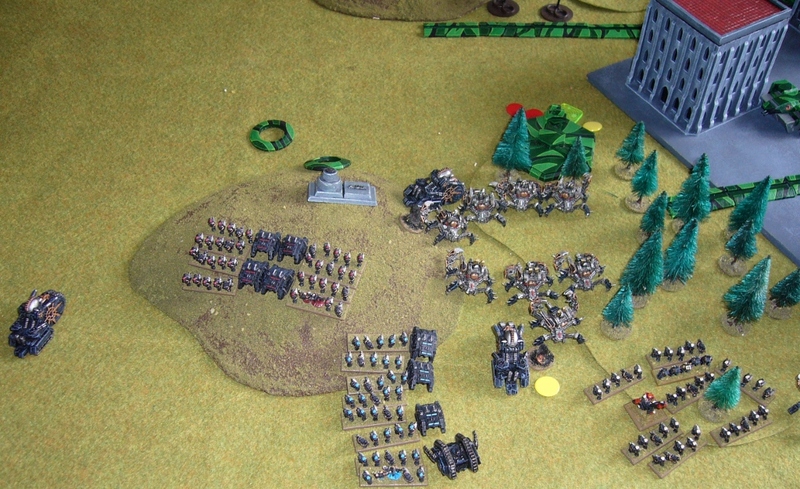 Holiday time means a few more Epic games. 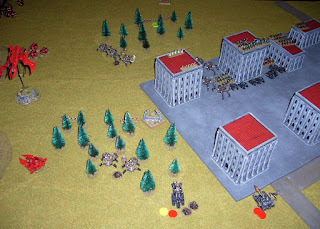 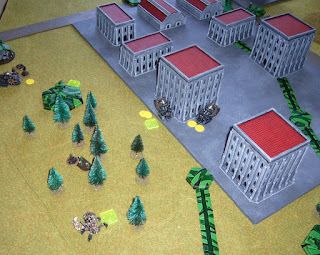 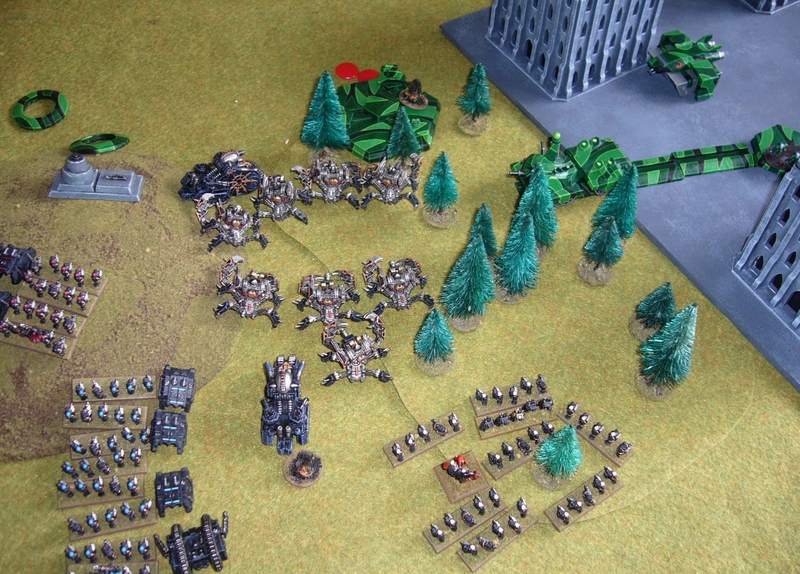 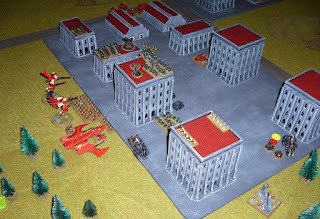 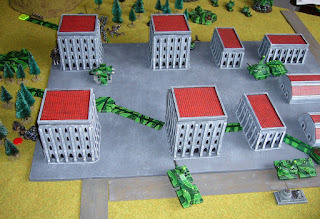 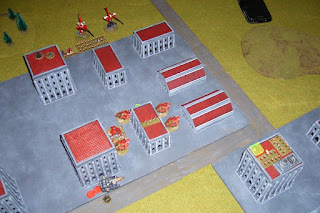 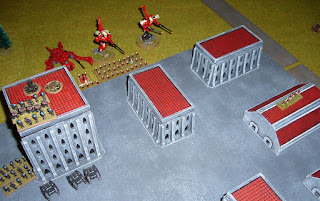 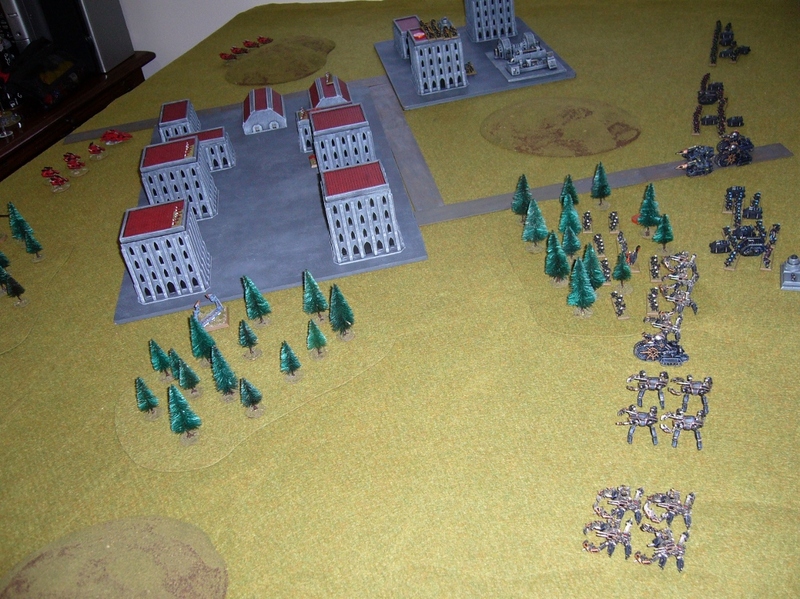 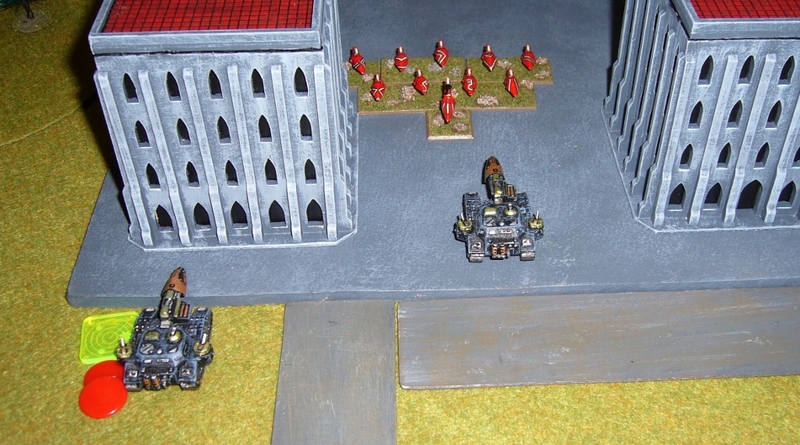 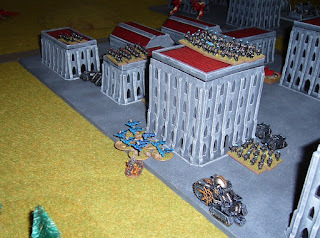 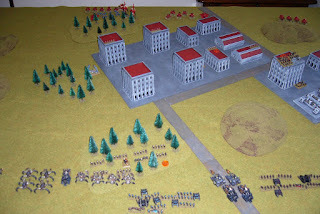 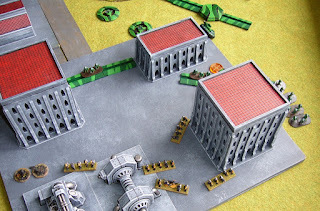 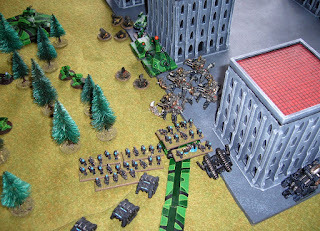 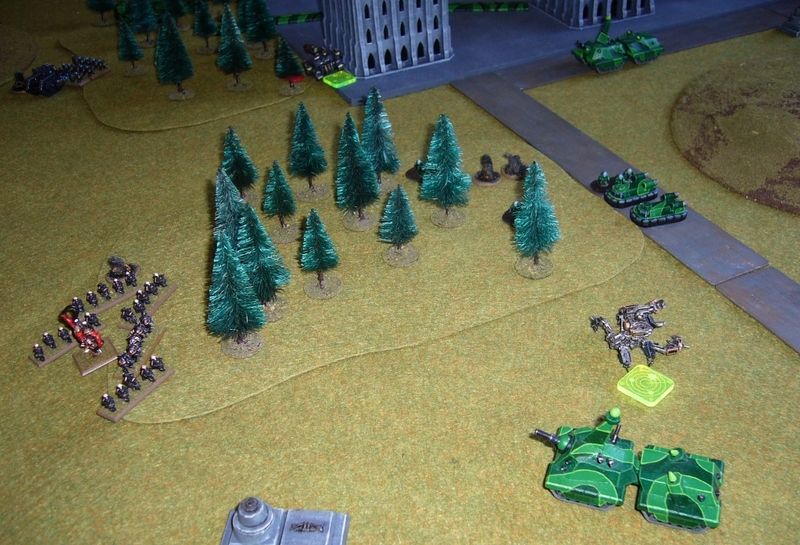 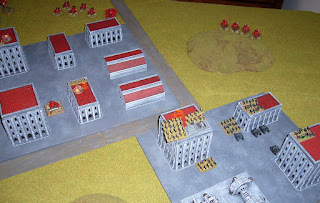 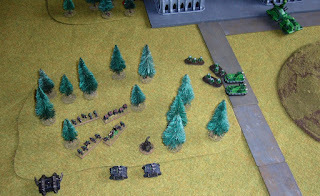 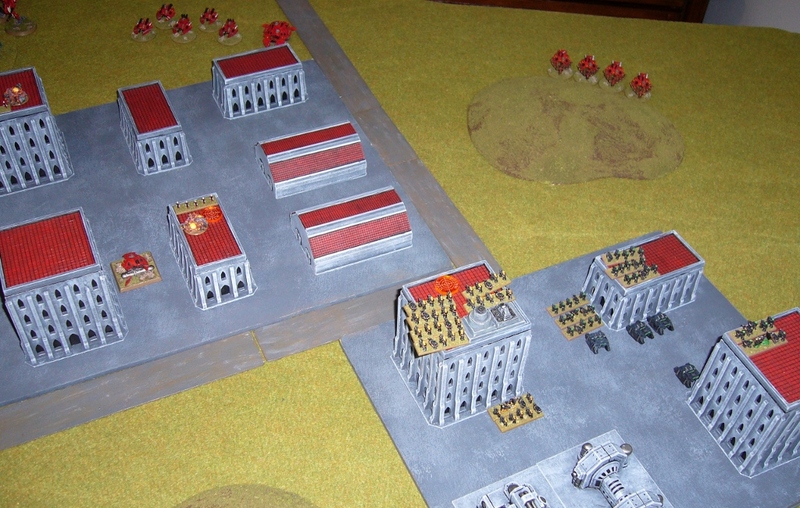 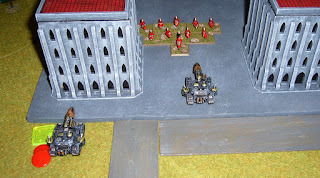 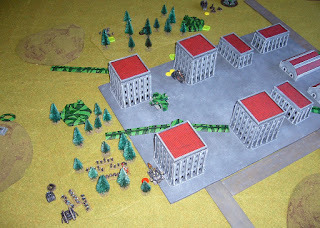 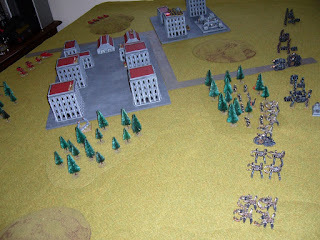 Here's the first, where I took my Black Legion with some newly painted units for a run against new scratch built forces from Andrew using an Imperial Fist list. 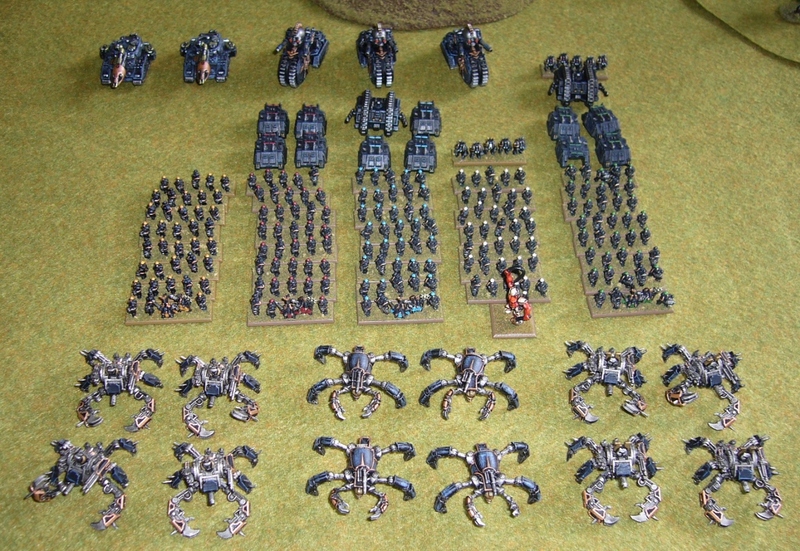 Here's my Black Legion list, lots of Crabs (Defilers), Deathwheels, Decimators and infantry. Andrew used his Marines as Imperial Fists in this game, with lots of freshly produced laser cut fortifications, and also Thudd Gunns and Tarantulas! (Imperial Lists and Marine armies like them specialise in defensive warfare, with excellent use of fortifications and the like). 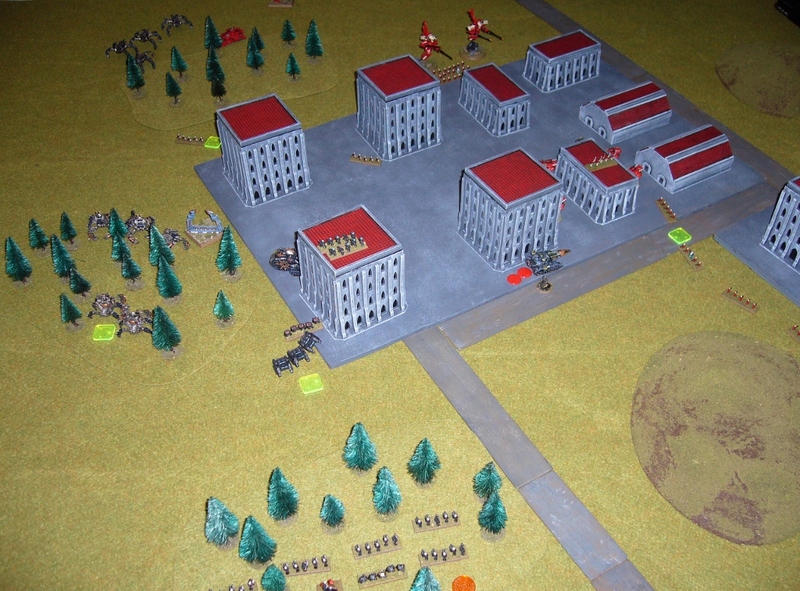 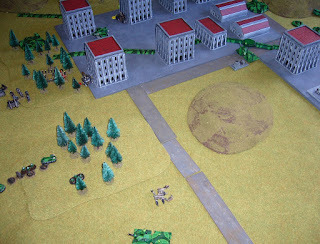 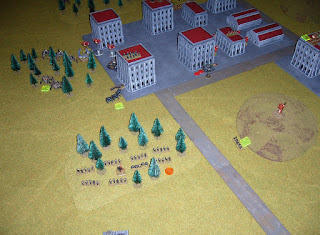 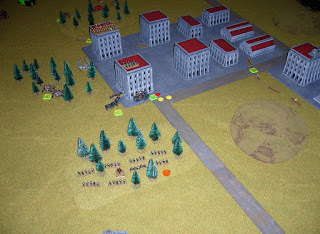 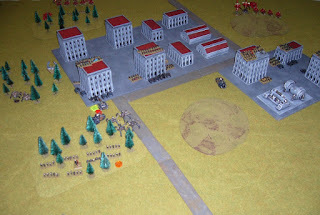 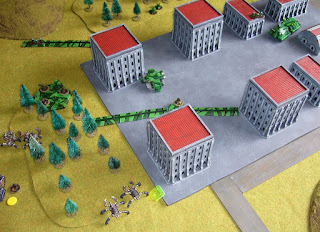 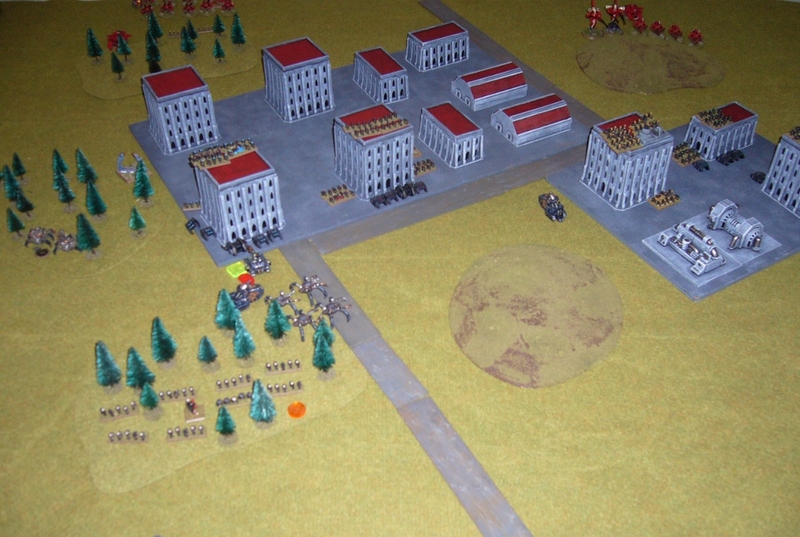 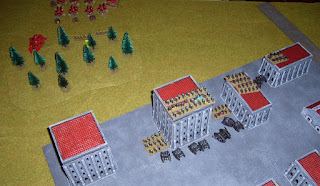 While Andrew favours his left, as he has fortification lines stretching in an unbroken line right through the city. 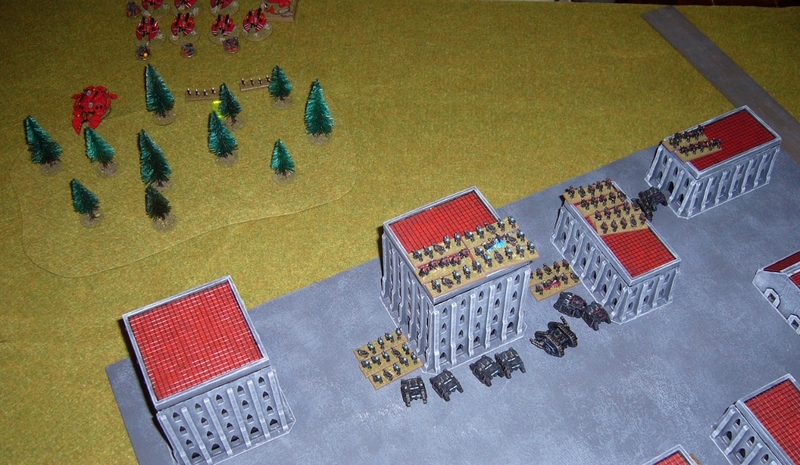 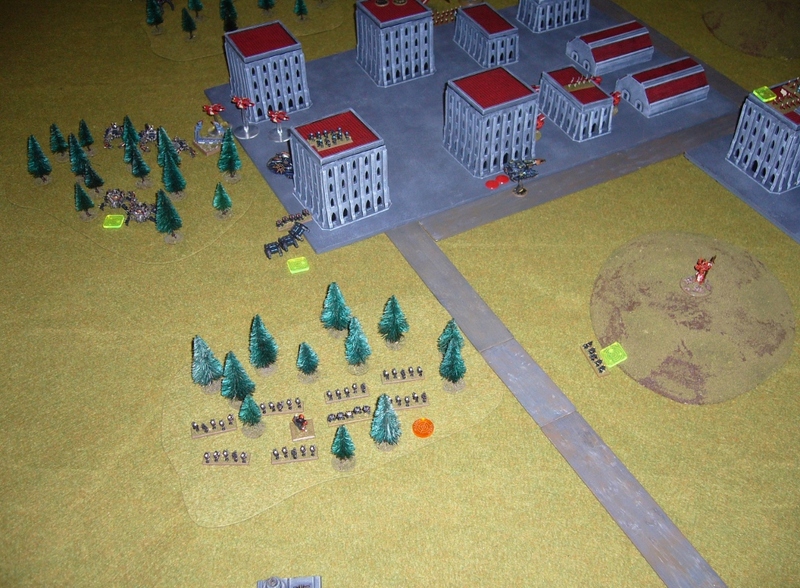 Marine Scouts then engage and break my suppressed Retinue on my right flank. 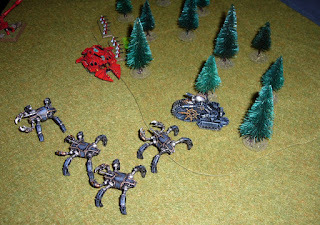 I keep up the pressure on the left, and a Fellblade moves into the city and destroys two of my Crabs. 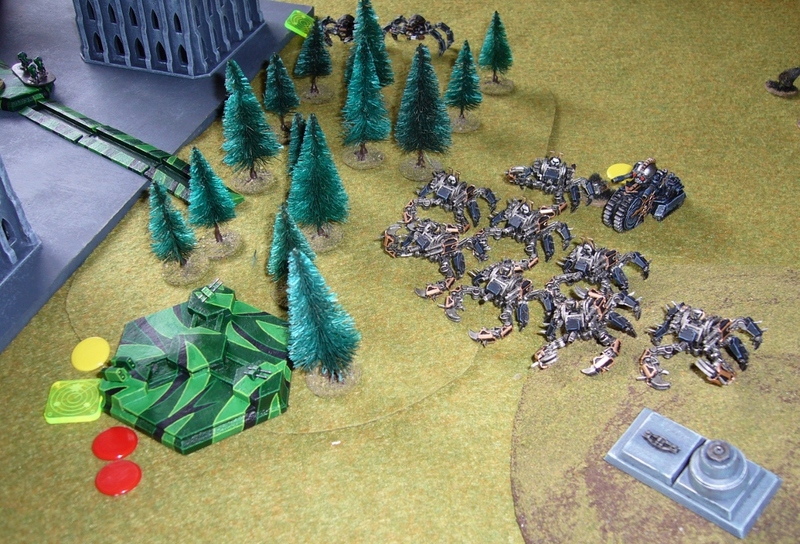 But more Crabs and Deathwheels push foward, breaking the first Bastion, damaging it, and destroying its Tarantula supports. 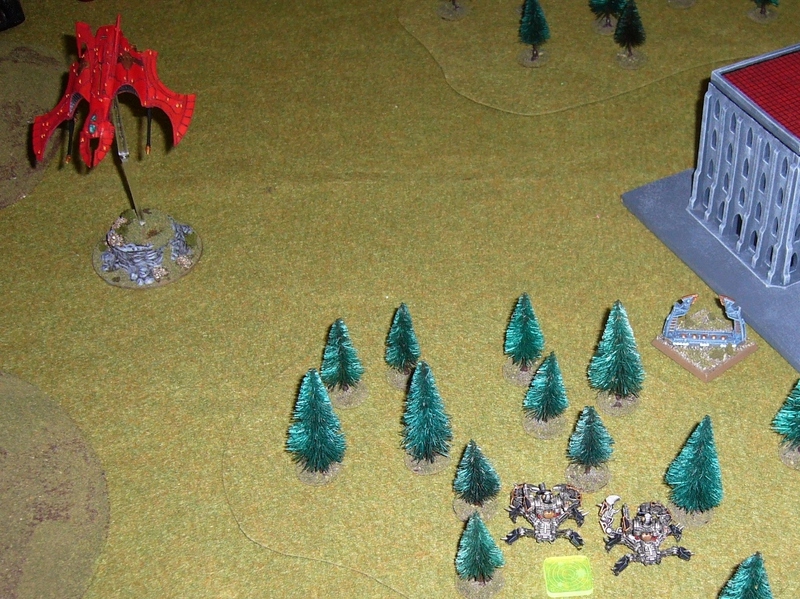 I swing all the Chaos forces left, taking advantage of the forested areas to provide cover. 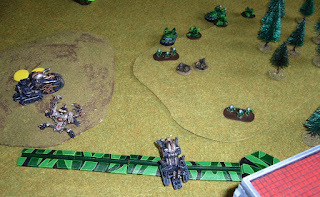 Also the Marine trenchlines end here, so I plan to go around the flank of them! 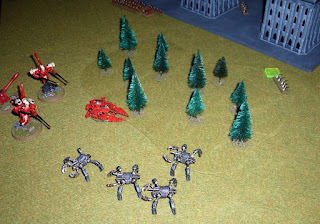 The Marine Fellblades advance through the town, and destroy one of my Decimators that gets too close. Marines win Strategy Roll, and one of the Fellblades bravely (suicidally?) 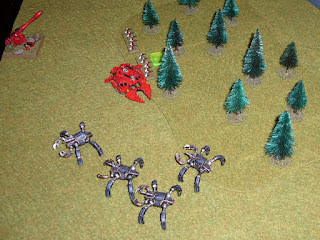 doubles into the woods and blasts a Defiler formation, killing one of them. The Fellblade take three damage and is forced back broken, then later destroyed by a shot from my Blitz garrison Retinue. The Bastion here is also destroyed. The Crabs scuttle onwards attacking the Marine Commanders formation killing two of them. And pushing onwards and killing another Fellblade. Fellblades outflank them and fire back. Broken Chaos formations fall back behind the woods. 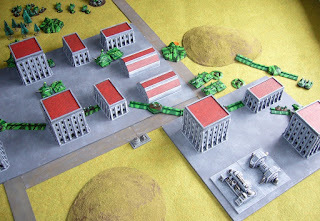 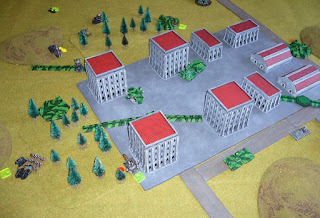 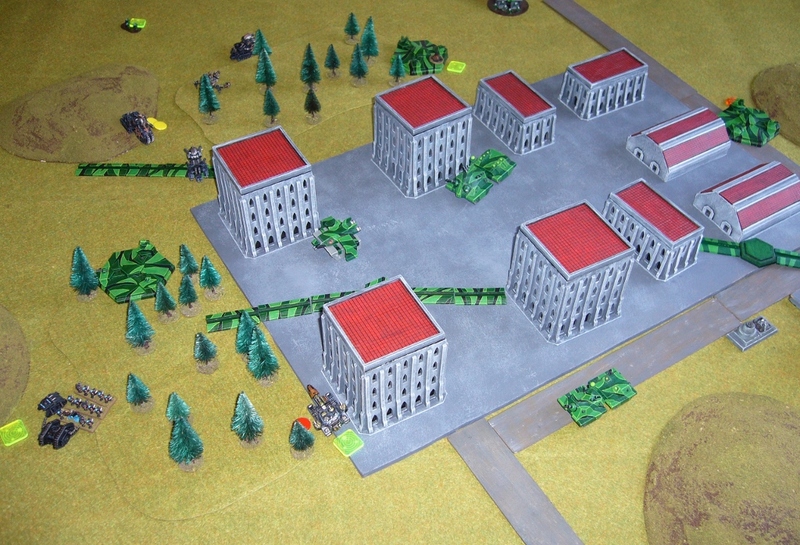 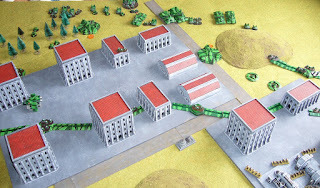 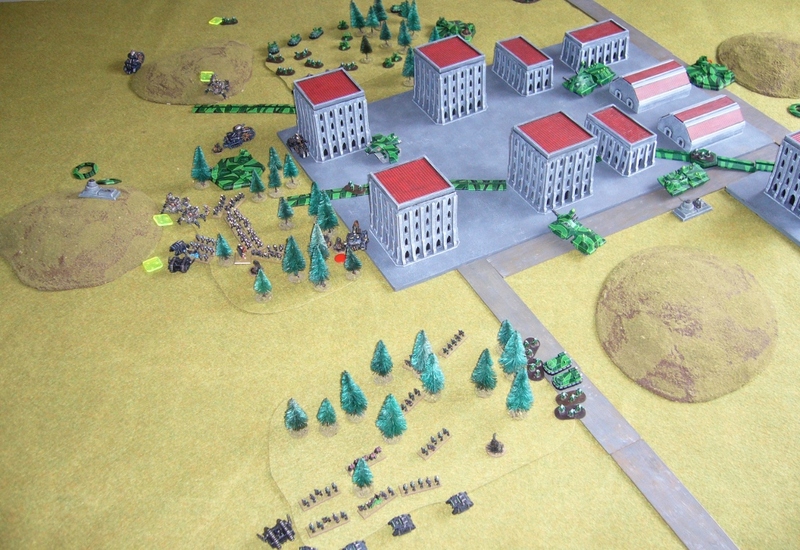 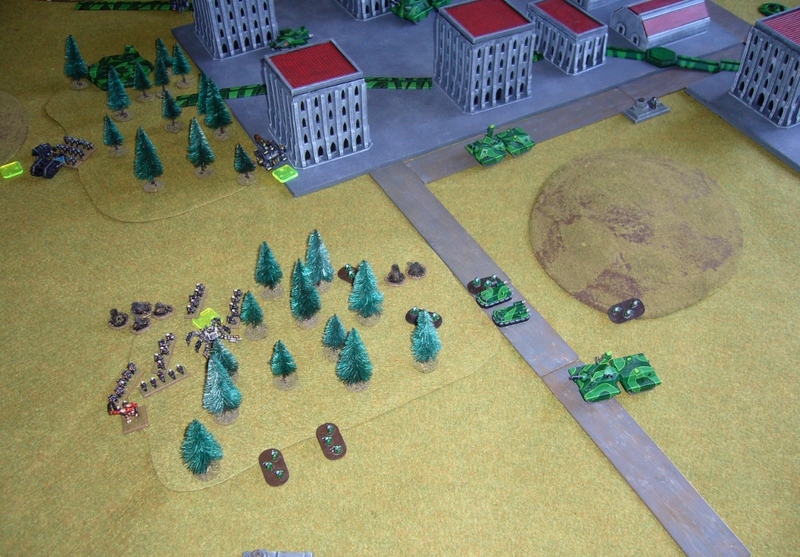 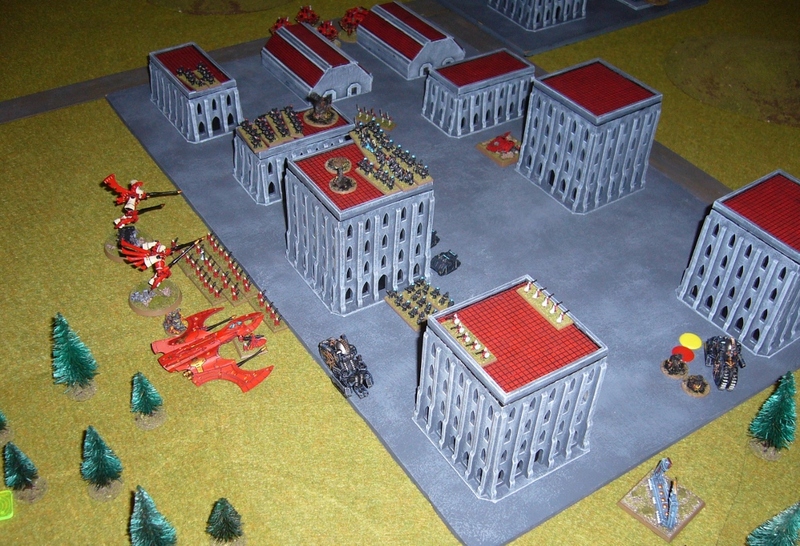 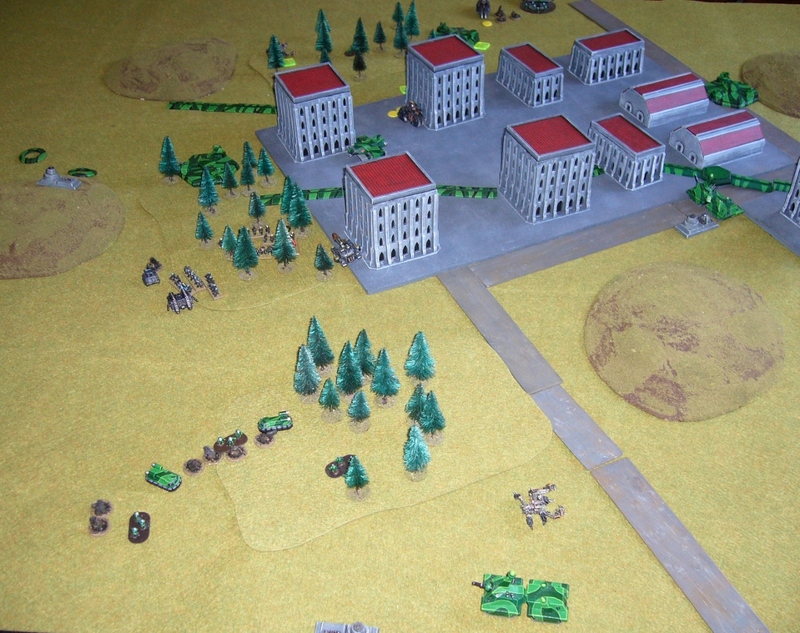 Marines push hard towards the Chaos Blitz. 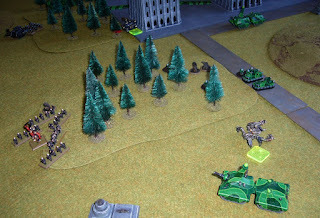 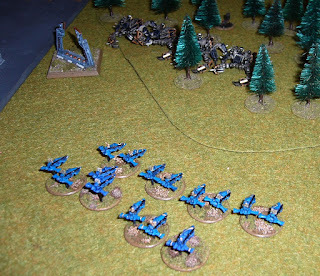 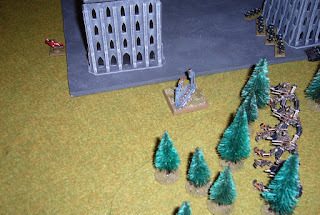 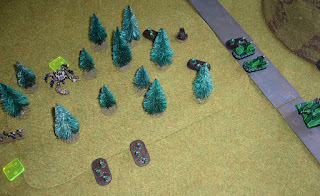 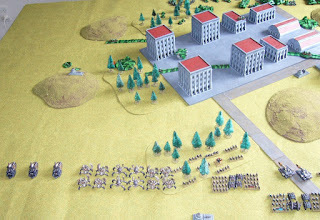 Marines win Strategy Roll again, and the Scout formation led by a Chaplain engages and break my garrison guard Retinue (and Break Their Spirit formation) in a clipping assault in the woods. 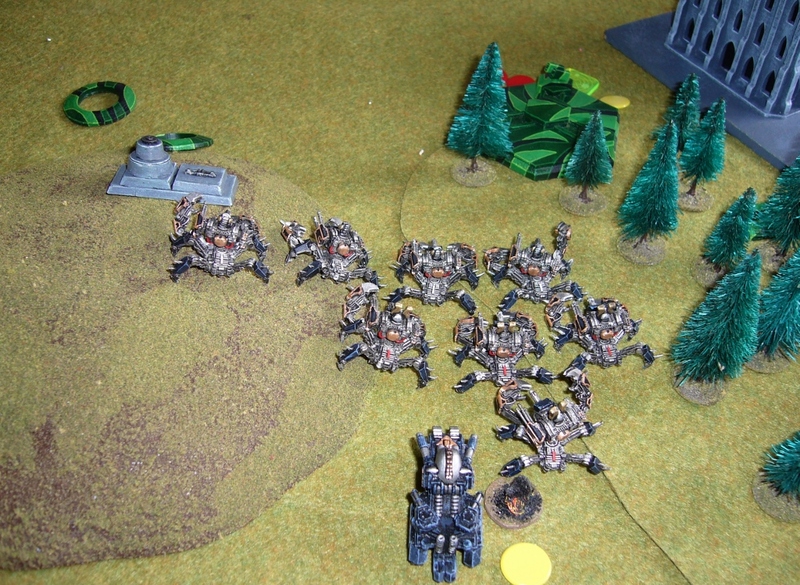 But two Deathwheels and a Defiler manage a similar trick on the other side of the table, breaking three formations including destroying the Marine Supreme Comander whose formation had already lost all other units. 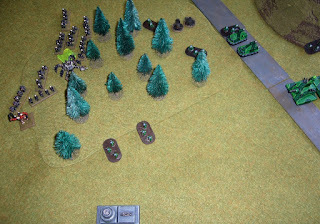 Two Defilers charge back to try and help out at my Blitz Objective, killing a Scout but losing a unit too and losing the combat. My Break Their Spirit Formation is also wiped out. 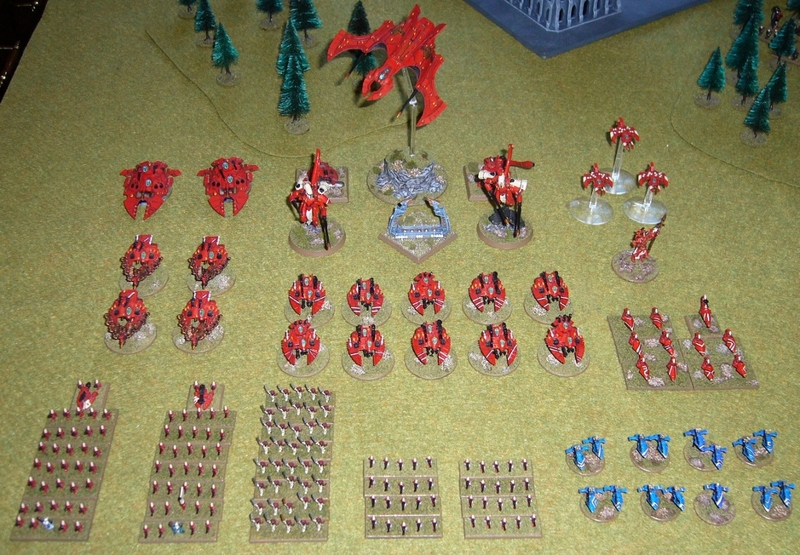 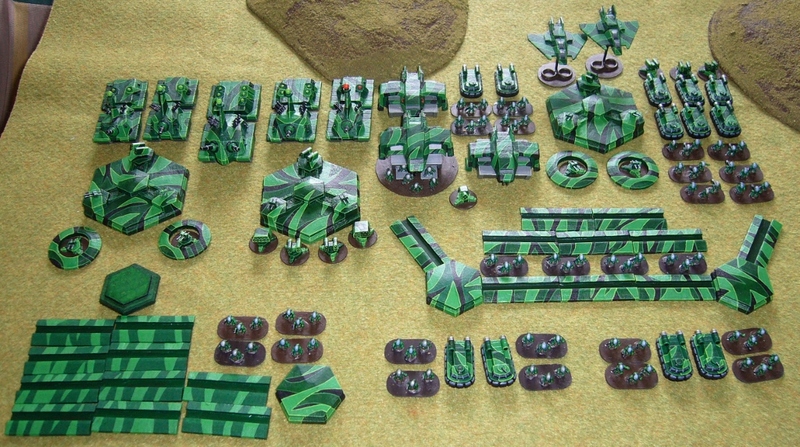 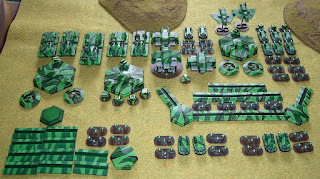 My Supreme Commander formation, including Daemon Prince doubles back to hold my Blitz. 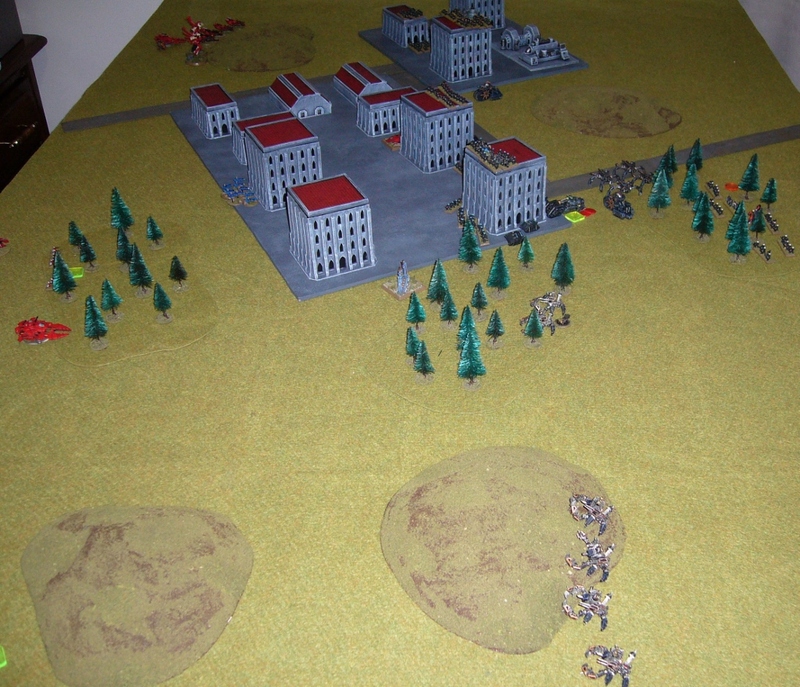 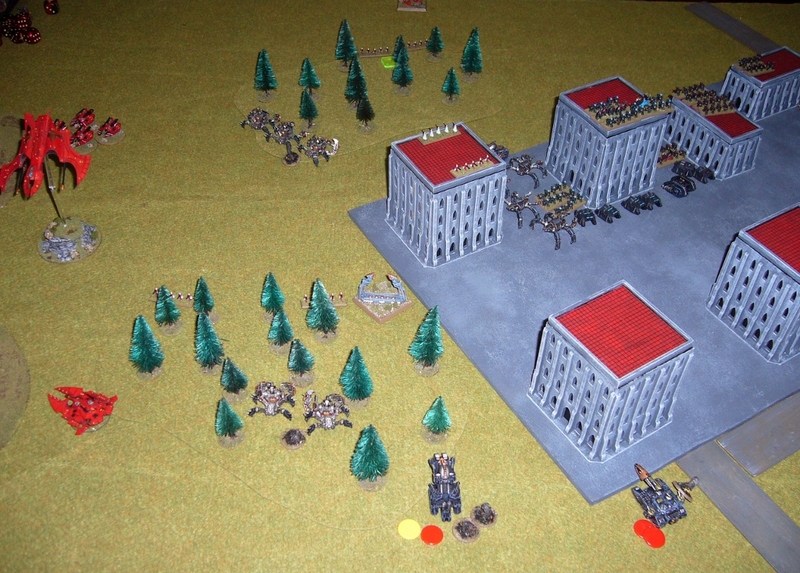 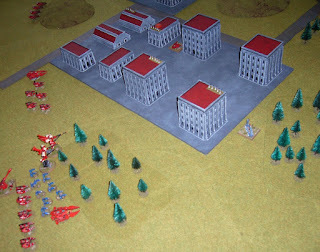 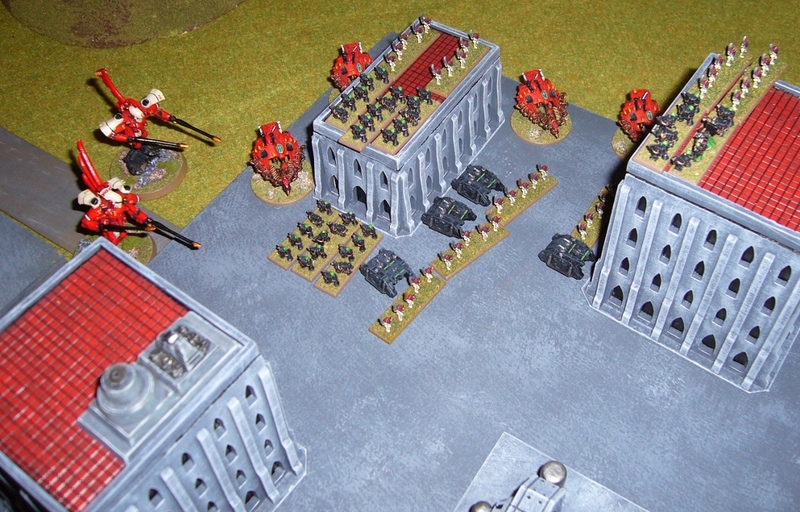 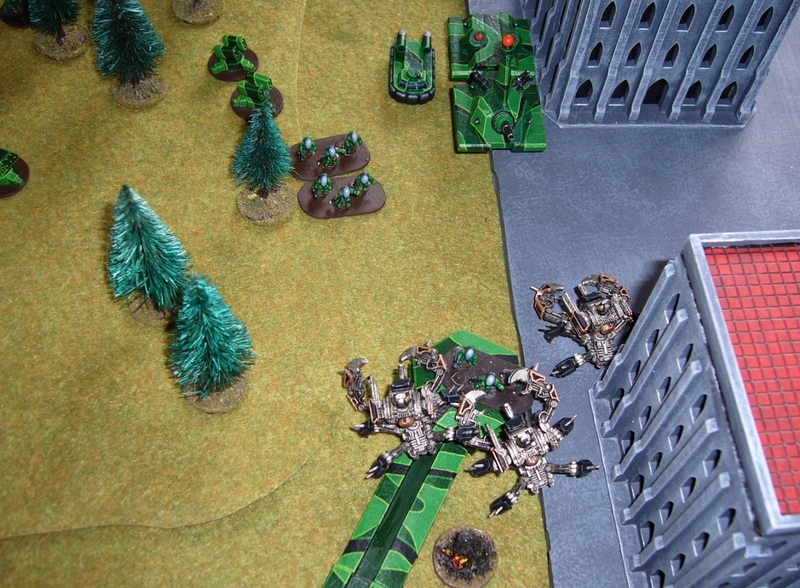 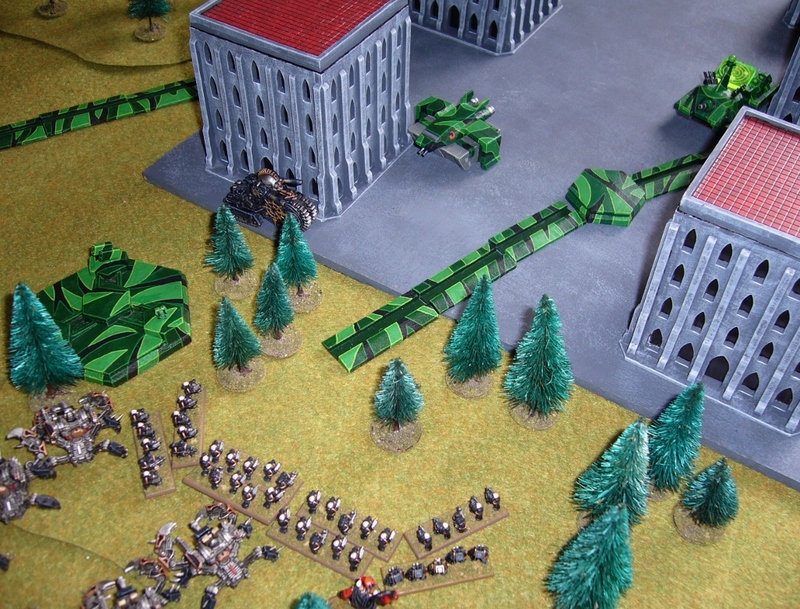 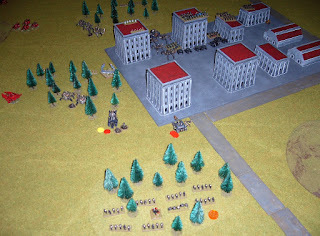 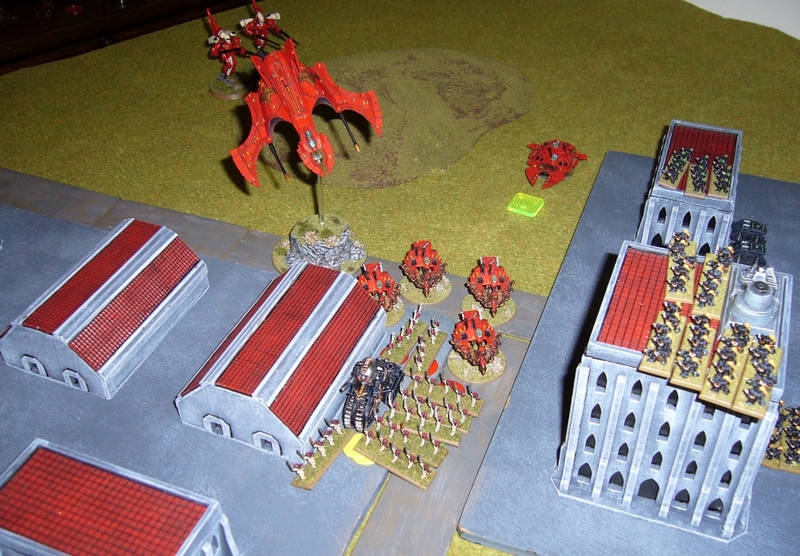 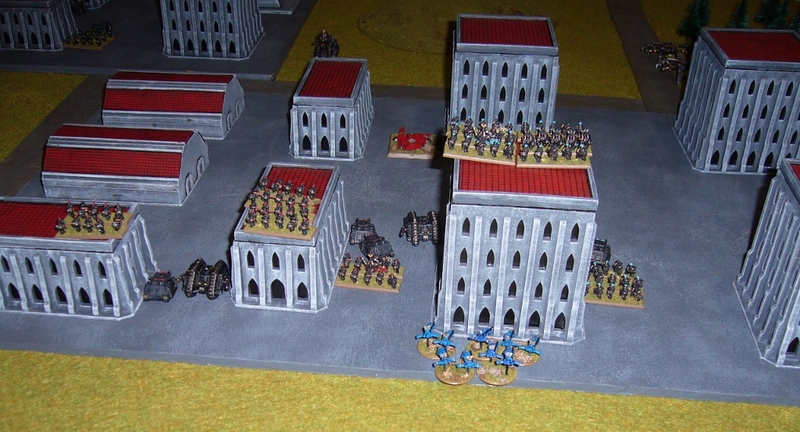 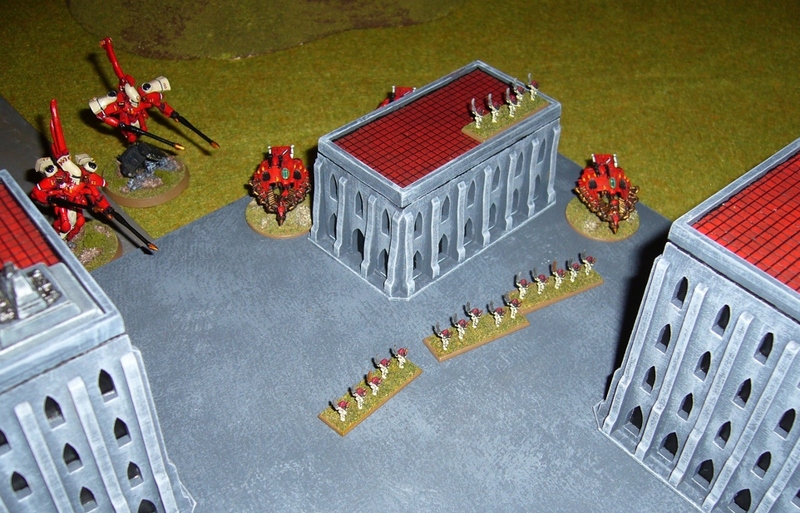 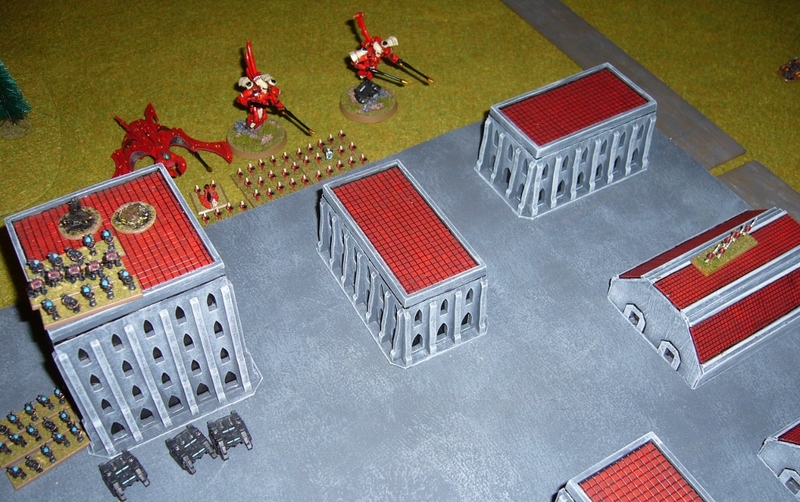 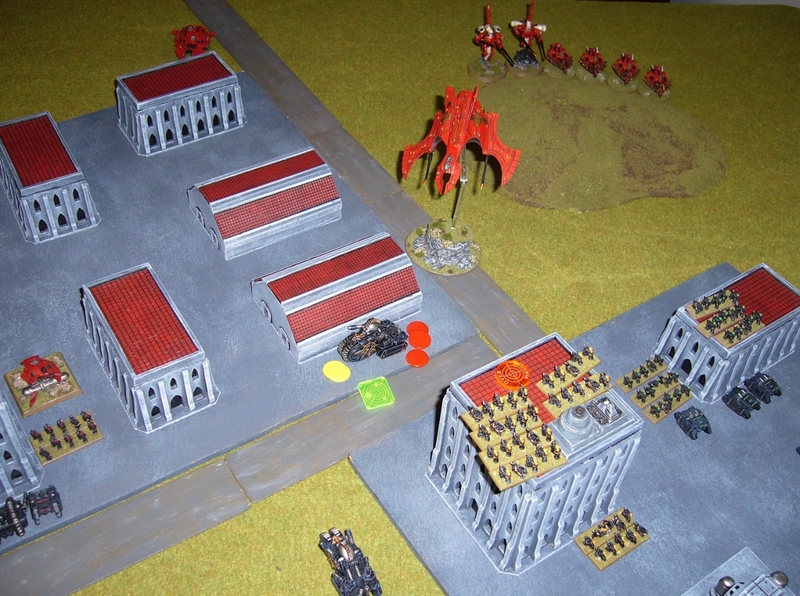 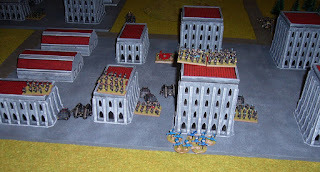 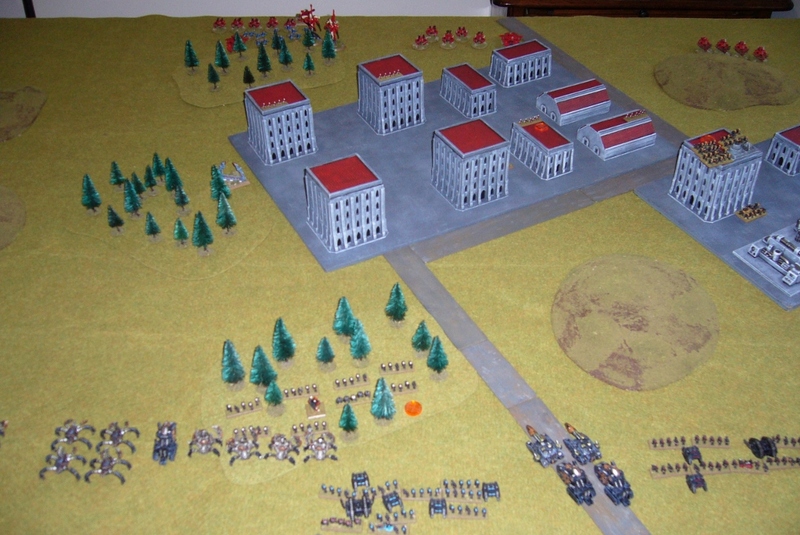 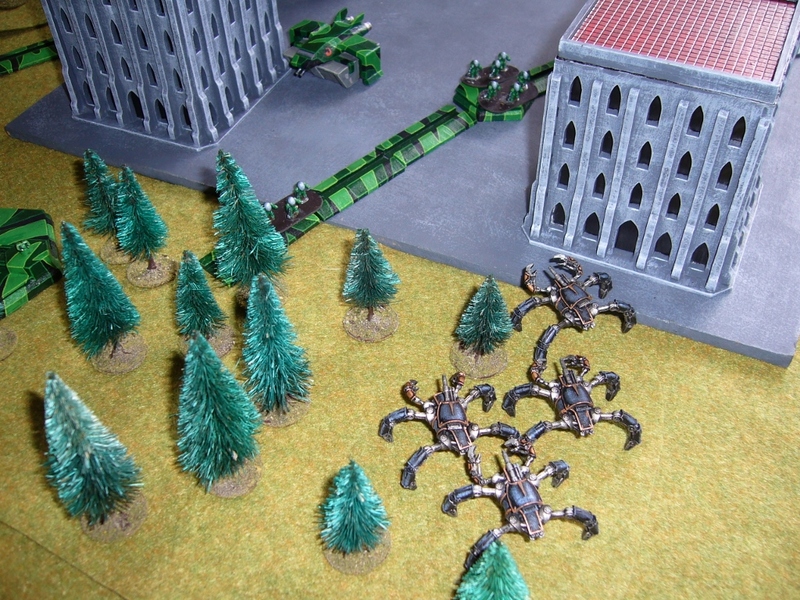 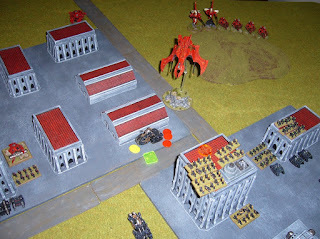 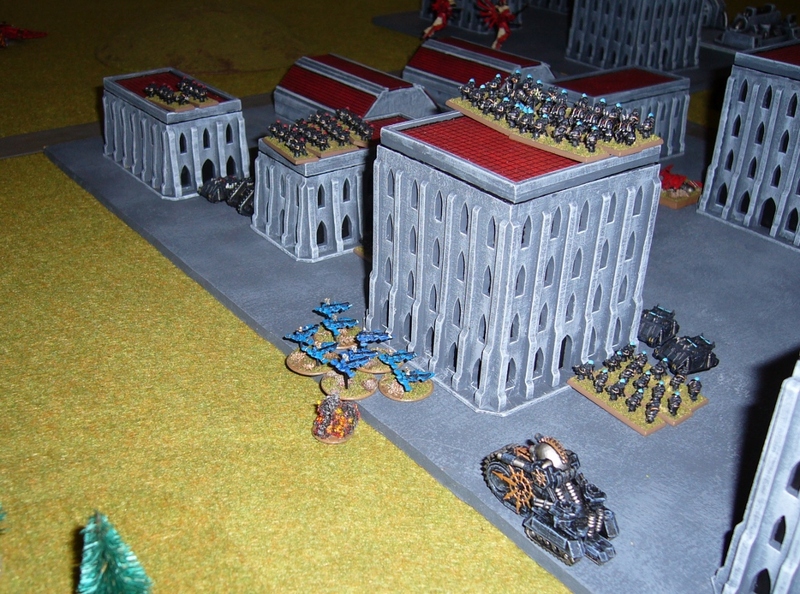 Marines attack the Daemon Prince formation. 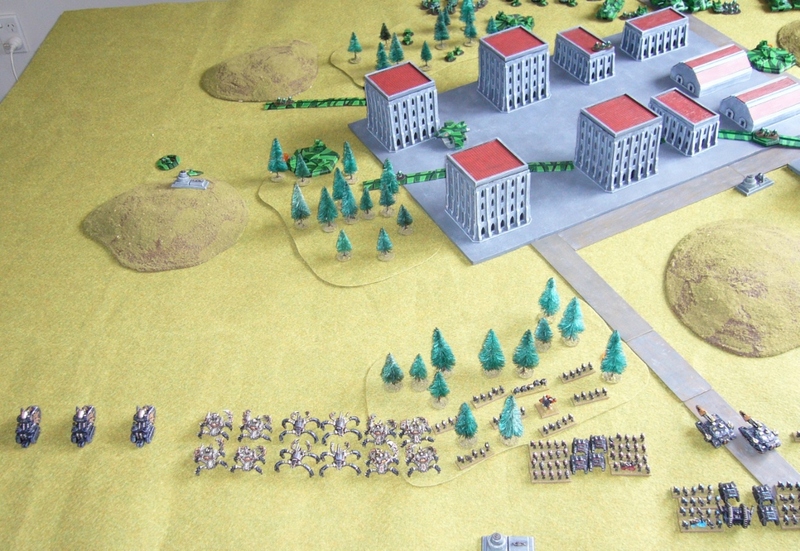 Both sides are looking thin on the ground. 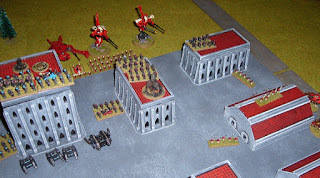 ...breaking my Supreme Commander formation, screening my objective with Scouts and taking it. 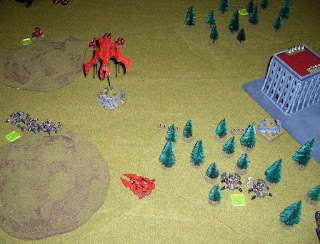 I try a desperate engage to help out but it fails due to bad positioning and the Scouts avoid it. My Deathwheels and remaining units are still clearing the city however, and I also achieve Break Their Spirit and capture the Marine Blitz objective! Last activation of the turn, a Marine Fellblade needs to get lucky and critical with a long range shot against a Deathwheel to win the game on Victory Conditions. It fails to do so. 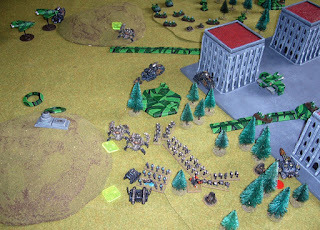 End of turn and Victory Conditions are tied 3-3! 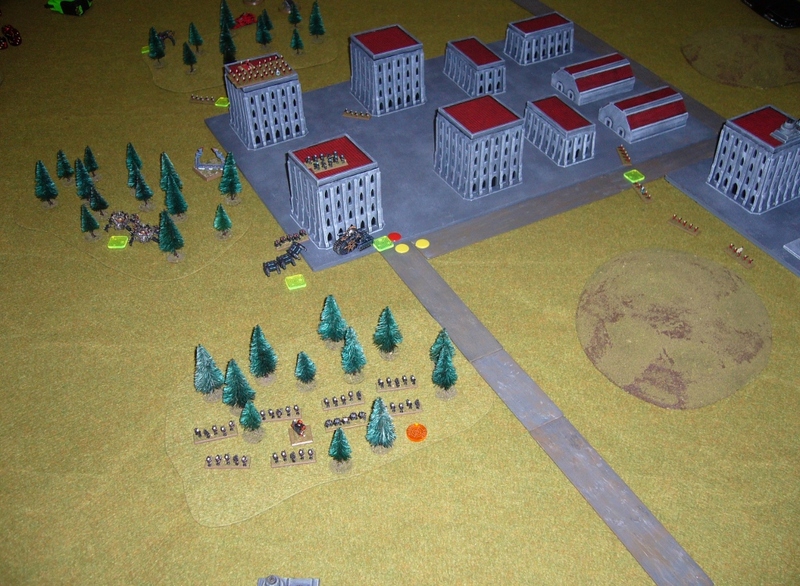 Both sides have Break Their Spirit, Take and Hold and Blitz. 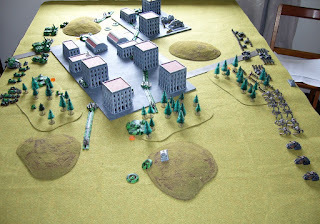 We roll for an extra turn and it doesn't happen. 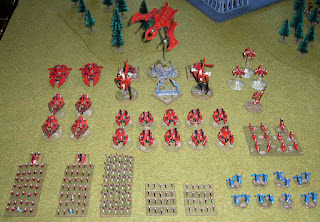 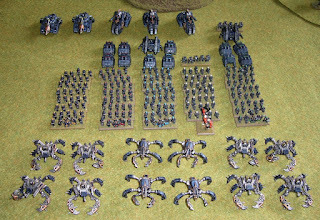 Victory points are decided, the Chaos have killed 2438 points of Marines, and the Marines 2174 points worth of Chaos! Narrow victory to the Chaos Black Legion. 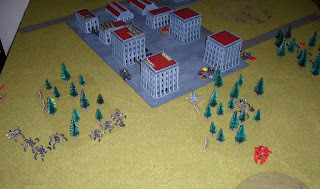 Interesting game and first one we've played where fortifications were used extensively. Given we turn up to games uncertain what army the other person will be playing, it was pure luck that I had taken 12 Defilers - whose heavy flamers, walker ability, and close combat and infiltration skills were pretty useful in this situation! Also the first game to go to a tie break with three Victory Conditions achieved by each side. 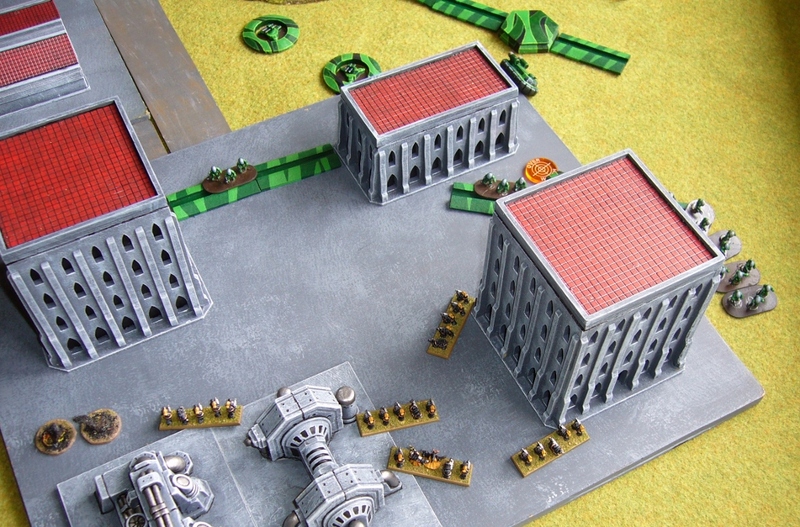 Doesn't get much closer than that!